Volume 1 of teach2talk’s™ Prepositions! series of videos helps teach children to understand and use a variety of critical prepositions, such as above, below, on, off, under, next to, in front of, behind, between, before, after, around, as well as many others. Our Prepositions! videos teach using targeted live action video modeling, featuring real children between the ages of five and fifteen. The children model the prepositions first in isolation and then in sentences to help build sentence structure. Humor, costumes and songs are used to keep your child engaged and provide additional reinforcement. 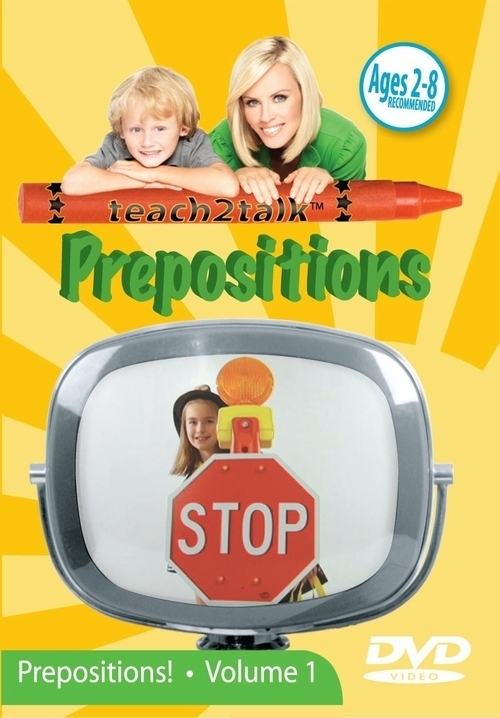 Volume 1 of our Prepositions! series is appropriate for any child who has not yet mastered the understanding and use of prepositions or who confuses these concepts as well as children who are just starting to learn and use prepositions. Children typically begin to develop their use of prepositions around two years of age. Prepositions! was created by a speech language pathologist who has extensive experience teaching children prepositions and other speech and language concepts, including through the use of video modeling, which research has shown to be an effective learning methodology for many children. My son Evan had a terrible time figuring out prepositions. It really held him back from following directions and from putting together longer sentences to really express himself. I had therapists coming over every day to help teach Evan, but always wished there was more I could do. Our Prepositions! video is something you use on your own schedule as a great boost to traditional therapy. Prepositions are important building blocks for every child’s functional communication system, and allow children to utilize more complex sentence structure. However, most of the children I work with have difficulty with these critical concepts - our Prepositions! video helps parents and therapists teach them.